A.J. Sager pitched for the Padres, Rockies and Tigers from 1994 to 1998. In 123 games he went 12-15 with a 5.36 ERA. He is currently roving pitching instructor for the Detroit Tigers. I covered Dodson's in the 1987 set. The photography mishap here, with the contents of the advertisement Sager is posing next to obliterated by the flash, is from the actual card, not my photo of it. 1990 Donruss Rookies - needed almost the whole set. 1991 Donruss Rookies - needed well over half the set. 1992 Fleer Update - needed the entire set! 1992 Pinnalce Mantle - needed the entire set! Each of those boxes were a buck. I also bought four binders for $5 each. Each binder was meticulously labelled with the contents, making blogging them very easy. I included a card from the first page of each binder for visual interest. 1988 Topps All-Stars - already had the set. Anyone want a complete set? 1987 Topps All-Stars - already had the set. Anyone want a complete set? 1986 Topps All-Stars - already had the set. Anyone want a complete set? 1985 Topps All-Stars - I only needed Rice, Ozzie and Murphy. Rest of set up for trade. 1984 Topps All-Stars - already had the set. Anyone want a complete set? 1988 Toys R Us - already had the set. Anyone want a complete set? 1989 Ames - already had the set. Anyone want a complete set? 1988 Fleer All-Stars - I needed the entire set! 1988 Donruss Rookies - already had the set. Anyone want a complete set? 1986 Fleer Baseball's Best - Just needed Canseco and Clark. Rest are up for trade. 1987 Fleer Record Setters - Just needed Canseco, Clemens, Gooden and Mattingly. Rest are up for trade. 1989 Fleer Exciting Stars - already had the set. Anyone want a complete set? 1989 Fleer For the Record - Needed three of the six cards in the set. Galarraga, Gibson and Maddux available for trade. 1986 Topps All-Stars Collectors Edition - Needed over half of the set. 1989 Donruss Rookies - already had the set. Anyone want a complete set? 1989 Donruss Traded - already had the set. Anyone want a complete set? 1990 Kay Bee - surprise, it wasn't included in the list. I needed the whole set! 1989 Donruss All-Stars - I just needed Gubicza, Dunston and Walk. Rest available for trade. 1988 Pro-Cards AAA All-Star Game - needed the whole set! 1989 Score Young Superstars set 1 - already had the set. Anyone want a complete set? 1989 Score Young Superstars set 2 - just the opposite - I needed the whole set! 1986 Woolworth - I had just picked up the Schmidt from Al. Also already had Baylor, Mattingly, McRae and Winfield so they are up for trade too. Needed the rest. He also let me look through some other boxes and pull out a few cards for free. I picked up three Star Don Mattingly sets. Turns out the one with Mike Schmidt was also in one of the binders so now I have an extra to trade. I know I needed a few key cards from 1986 Topps Traded. I had all three of these though so all are up for trade. Blogger flipped this sideways but I'm not going to bother flipping it back.Yes that is an autographed Gregg Jefferies card thrown in for free. I also picked up a couple of Sportflics cards. 1989 and 1990 are pretty hard to find compared to earlier years. Outfielder Greg Smith played in the Padres organization from 1988 to 1990. In 304 games he hit .247 with 21 HR and 158 RBI. He has gone on to a long and successful career in scouting, and has been the Pirates' Director of Scouting since 2008. Regis Salon was in the 1987 set as well. Smith is posing with Regis Aquatic Shampoo, which I am guessing was a new product that Regis was trying to push in 1988, and unsuccessfully too, I guess, as the only web reference I can find for the product is one newspaper ad in 1988. 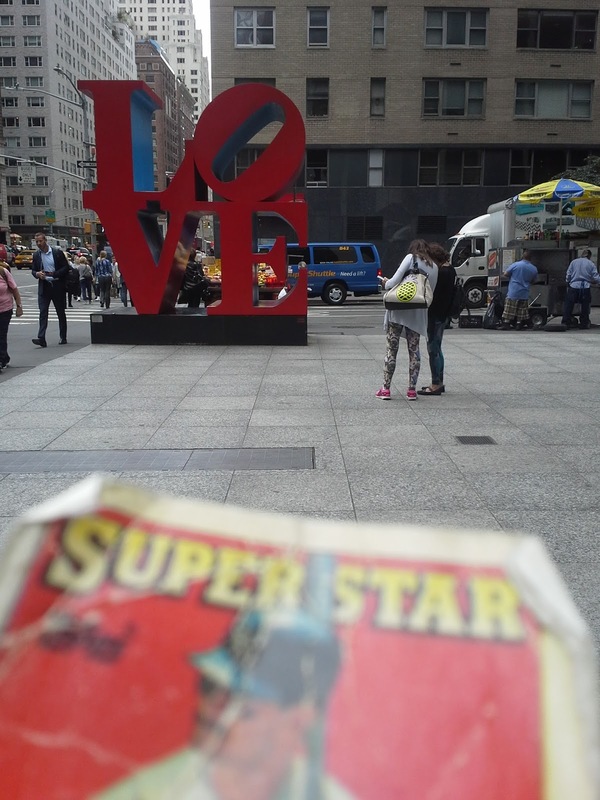 Contrary to popular belief this is not the original Love sculpture by Robert Indiana - that one resides, ironically enough, in Indiana. But the design was originally commissioned in 1964 for a MOMA Christmas card, and this sculpture is just a block away from that museum. For some reason ProCards called Scott Hall Bigham by the name Craig. Weird error. Second baseman Scott Bigham played three seasons in the Padres organization. In 327 games, he hit .270 with 0 HR, 108 RBI and 42 SB. A fuller account of his career can be found at The Greatest 21 Days. He is now a Senior Portfolio Manager at Morgan Stanley Financial Advisors in Salem, OR. Hamer's Men's Clothing operated four stores in Spokane from 1957 to 2001. Owner Dave Hamer closed the store in 2001 due to a slowdown in the retail sector and a general move towards casual clothes among younger men. In his interview with the Spokesman-Review that year Hamer bragged about some of the deceptive practices he used in the early days of his store. I picked the Fielder cards because one was shiny and the other was an interesting looking parallel. I picked the Castro cards just because he's a Yankee. Some neat 2014 parallels - a chrome, a gold border, and my first ever camo border. Appropriate that my first camo border is a Padre. 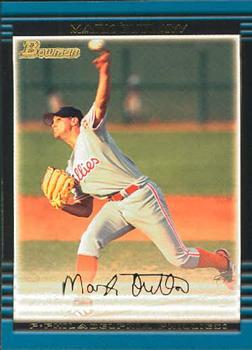 Mark Outlaw pitched in the Phillies organization from 1999 to 2003. His best season was 2000, when he went 5-2 with 11 saves and a 0.94 ERA for Piedmont. 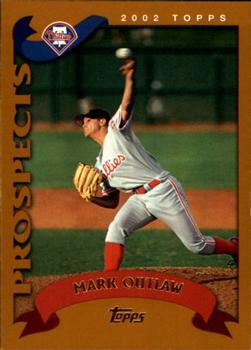 Overall in 173 games he went 16-11 with 24 saves and a 3.41 ERA. Now a Client Manager at Baylor Scott & White Health Plan in Texas, he kindly answered my questions about baseball cards. Yes, I collected baseball cards growing up starting at an early age. My parents and grandmother would buy me cards when they went to the grocery store. I liked the gum that was inside. This was during the 1980’s and the beginning of the big baseball card boom. I had an old price guide that came with a baseball card collecting kit. In that price guide, it listed a 1984 Donruss Don Mattingly rookie card at $3. One day, I went to a local baseball card shop, Bankston’s, and they had the card in a case selling for $100. At nine years old, I had to do a double take. Surely, that wasn’t the same card? After examining and questioning the workers there, I determined it was the same card. I was rich!!! That got me hooked even more. I always loved baseball, and this just added more excitement to it. When I was a little older, my grandmother gave me a box of cards that I had left all over her house throughout the years. In that box contained Joe Montana and Jerry Rice rookie cards. That was an awesome find! Do you have a favorite card of yourself or of another player? Two cards come to mind. One is the 1991 Upper Deck Michael Jordan. I was a big fan of his and seeing him in a baseball uniform made it twice as exciting. 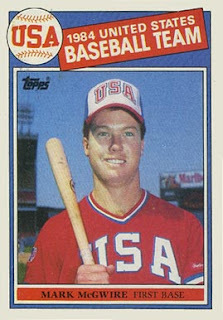 The other card is the 1985 Topps Mark McGwire USA. McGwire came onto the MLB scene very hot and was an exciting player to watch. This was also a year or so after the 1984 Olympics and everyone was patriotic. It was cool seeing him in a USA uniform. Do you have any stories about cards of yourself or of other players? Being a huge baseball card collector growing up, I was so excited to sign my first contract with Topps. A Topps representative met me one day at our baseball stadium in Reading, Pennsylvania (Phillies AA) and I signed 2000 cards for them. I think it all sunk in when I saw my card listed in the Beckett price guide. I grew up looking up card prices in that magazine and it was very humbling to see my name in there. I was very proud and honored. My girlfriend at the time and wife now were walking through the mall one day when we saw a box of 2002 in a toy store. I told her that I had a card in that set. She said she was going to buy a pack. I told her that I wouldn’t be in that pack, because there were hundreds of cards in that set. Sure enough she opened the pack and my card was in there. I thought that was pretty cool and a great silent brag. In the early twentieth century cab call signs could be seen at every major hotel and entertainment venue, providing an easy way for people to know when their cab had arrived. People would take a number and wait for their number to flash on the sign, meaning that their cab had arrived. Today they are all but extinct, with the last cab call left in the city perched above the marquee of the St. Regis Hotel, with the numbers always displayed as 000. Luis Lopez played eleven seasons in the major leagues as a backup infielder for the Padres, Mets, Brewers, Orioles and Reds. In 721 games he hit .241 with 22 HR and 151 RBI. I think this photo, like the last one (Pedro Aquino Martinez), was from JC Penney. I'll start off with an Indian. I think every baseball card blogger who is not a Cub fan should be rooting for the Indians, given all of Tribecards's immense generosity through the years. Interesting background on this card. A Brett Gardner rookie card! This is one of the better no-logo photos you will see. I recently had the honor of being the first trade partner in over a year for Heartbreaking Cards of Staggering Genius. Matt focused his part of the trade on completing or near-completing a whole bunch of sets for me. The cards I have left over in these sets are primarily commons or minor stars that I bet a bunch of you trade partners out there could help me out with. 1988 Donruss rookies - COMPLETE! The checklist was the last one I needed. 1992 Donruss Triple Play - down to two common cards - #94 Lenny Dyktstra and #222 Billy Hatcher. 1994 Leaf Limited - COMPLETE! 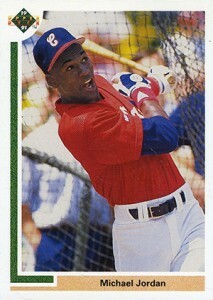 1993 Select - Just one card left but it's a biggie - the Derek Jeter rookie. 1996 Topps - this should have been completed, but I had made an error in my want list and I still need one more - #189 John Smoltz. 2002 Topps is maddening because I bought a "complete set" that turned out to be missing two key cards. The Mauer rookie was one. 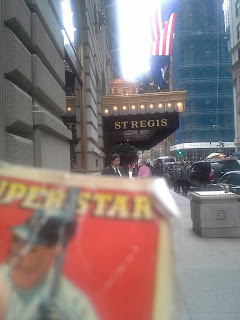 I still need #365 which was the Barry Bonds 73rd Home Run card. They made 73 different versions of that card, I would just want one version to complete the set. 2006 Topps - COMPLETE! Jeter was the only card I needed. 1993 Ultra - down to just one card - #639 Roberto Alomar. 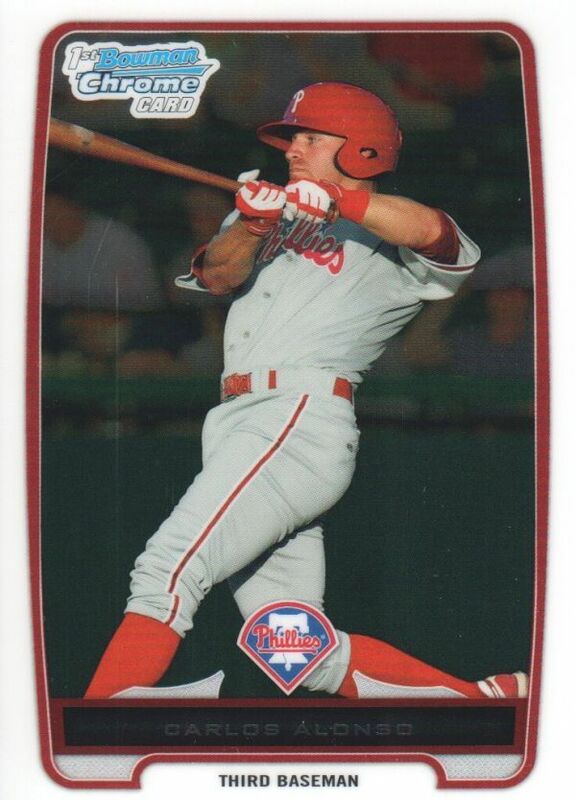 Infielder Carlos Alonso played seven seasons in the Phillies organization. In 487 games he hit .270 with 24 HR and 183 RBI. Now a minor league coach in the Phillies organization, he kindly answered my questions about baseball cards. "Always collected cards since I was a little boy. I haven't bought baseball cards since I was 15 years old. I have a collection passed down to me from my grandpa. My favorite player has always been Barry Bonds and my favorite card of myself is my first year, I was swinging at a high pitch so the swing looked really funny. 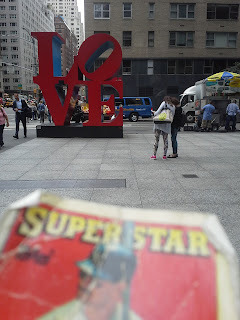 Collecting cards is an amazing hobby that I hope to pass down to my kids someday." Outfielder Stephen Chapman played in the Brewers and Cubs organizations from 2004 to 2009. His best season was 2007, when he hit .262 with 24 HR and 89 RBI for West Virginia. Overall in 490 games he hit .245 with 60 HR and 232 RBI. Now a Firefighter Paramedic for the city of Pinellas Park, FL, he kindly answered my questions about baseball cards. "I do know that they took about 20 pictures of different poses and normally picked the worst pose of them all to us for the card haha. I used to collect cards growing up but I really don't much anymore." Al keeps bugging me to go to his show on Friday - I'm not going to go but if anyone is going to be in New York and wants to check out something different it would probably be a good time. Ragira would make a pretty good name for a metal band. He played three years in the Giants system. I had never heard of him - just picked the card because I love the awesome shiny super-refractor design. This refractor looks really good in person - Bob Gibson's name and photo really look great in the refractor effect. I also picked some older cards, like this Big Unit. And this Woolworths Mike Schmidt oddball. Pedro Aquino Martinez was in the 1987 set too. He faced the hall of famer Pedro Jaime Martinez in his last game as a Met, as detailed on his entry on The Amazing Shea Stadium Autograph project. I think this photo was taken in JC Penney, but no way to be sure. Lubratich was in the last set too. Other blogs that have shown Lubratich cards are 1986 Procards, Capewood's Collections, The Angels, In Order and View from the Skybox. Lubratich and Whitney Houston are at DJ's Sound City, which was also in the last set. Another DJ's factoid is that they first record chain to sell laserdiscs. Always nice to see some shiny! Especially a shiny Yankee. The gold border looks good on 2012 Topps. Nice vintage photo of Lou Gehrig. Wooden floorboards in the Yankee Stadium dugout - I wonder if they lasted until the 1973 remodel. He sent most of the Cubs from the 2016 Topps set, including this Kris Bryant card. He also sent this custom Kris Bryant that looks just as good as any legit card. I've accumulated quite a few of his customs as he usually throws some into every trade. In fact this is the second Post Don Mattingly custom I've gotten from him, so it's a dupe that is up for trade (or, Gavin, if you can use it I'll return it to you).